Old Whittington Gala is a genuine community event and firstly, the Gala Committee would like to acknowledge, with thanks, the help of agencies and organisations without whose support the event would be difficult to stage. In particular, this years Gala sponsors, Julie and Manjit Sihota from the Nisa local store. This year's gala was held on Saturday 29th June on The Village Green, keeping up with the 24-year tradition of holding such an event within the village. This year, the Gala's visitors enjoyed a fine, dry and warm day, with about two thousand local residents coming out to enjoy the sunshine, see what was on offer and have some fun. 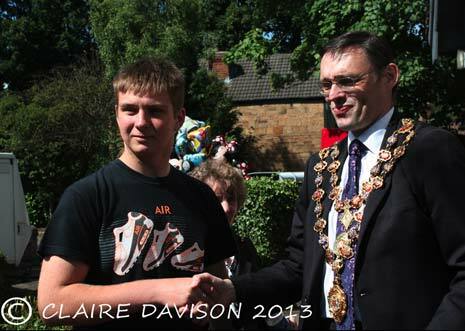 The Gala also had an increasing number of people from other parts of Chesterfield and surrounding areas attending, proving that the Old Whittington Gala is a popular event both in and out of the village. 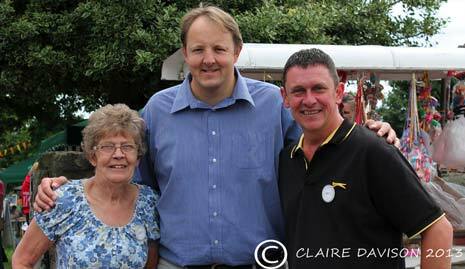 Toby Perkins, MP for Chesterfield, kindly opened the Gala then spent time walking around the stalls, talking to stall holders, revellers and embracing the community cohesion that is brought by holding such an event. 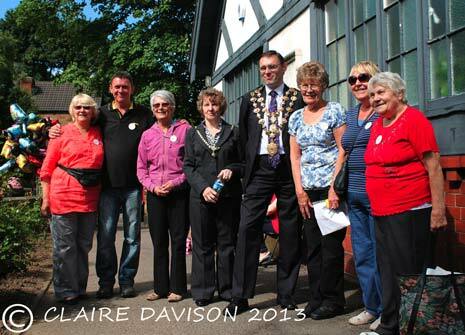 The Mayor of Chesterfield, Cllr Paul Stone and Mayoress of Chesterfield, Mrs Barbara Wallace, attended the Gala for the duration of the day, talking to people as they toured round the attractions and stalls, a Mayor's Appeal stall being one of the attractions. 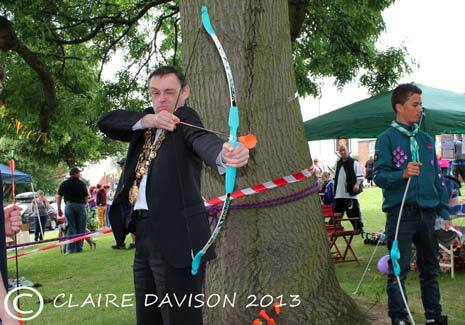 The Mayor and Mayoress very kindly drew the prize draw at the end of the Gala in which many prizes were up for grabs. Stalls were spread out over the village green and within Swanwick Hall, with a few stalls on the road adjoining Church Street North. This year, the Gala Committee booked market-type stalls, with a mixture of stall holders from the community and afar and also from the committee itself, who were raising funds for the four chosen charities: Chesterfield Paramedics; Chesterfield Prostate Cancer group; Kids 'n' Cancer UK and Marsh Lane Play Group. A refreshment area within the Swanwick Hall was also organised by the committee. The children's activities took up an area at the corner of the green, the inflatables and rides proving very popular, donkey rides proved a big hit, as did the Quad Bikes. The festivities provided by the Christians in Whittington included refreshments and an opportunity for everyone to ring church bells in the portable belfry. There were lots of attractions for the children all over the green to enjoy, including a stilt walker and the Birds of Prey provided a great insight for the children to learn how these birds live and behave, all of which helped to make the Gala a fun place for kids. This year's event featured The Hallamshire Military Band who provided music throughout the day as well as clog dancers, who provided an authentic feel to the Gala. 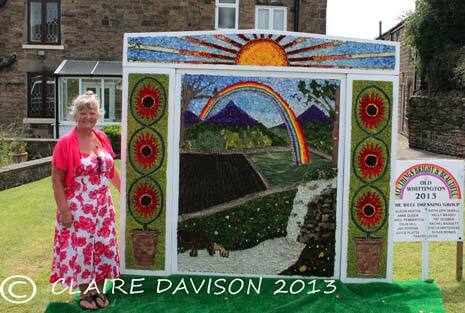 The Gala this year had two well dressings; one was to the theme of All Things Bright and Beautiful, (pictured below) created by the Ladies of the Well Dressing Group who are part of the Old Whittington Committee. A second well, created to the theme of a Bumble Bee flying, was created by NE Derbyshire Bolsover and Hasland Support Centre Key Stage 3 & 4 (pictured below). 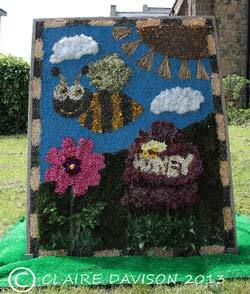 Both Well Dressings looked amazing and a big thank you goes to all who helped make them. The local church had their annual flower festival and the displays were breath taking in their construction and beauty. Hours of hard work were spent putting on such special and fabulous displays and again, a big thank you goes to all who were part of this. This year, there were many volunteers from the Gala committee and their friends and relatives. Hours of work have taken place in the lead up to the Gala as well as lots of hard work on the day, and the Committee gives a massive 'thank you' to all of them! They got through a vast range of work: setting up stalls, providing refreshments, looking after lost children, picking up litter and managing stalls, tidying up after the Gala and more. Chair of the Gala Committee, Mr Simon Kendrick said, "The Old Whittington Gala is an annual event that the whole community looks forward to. It brings together new and old in a day of fun and excitement. "Being a community group, it gives us immense pride in allowing people to have fun, especially in these days of tough economic challenges. For a few hours, the community join as one. Further, the Gala has raised thousands of pounds over the years for needy charities, local and national. "This year, we are proud to be raising money for four charities - Chesterfield Paramedics, Chesterfield Prostate Cancer Group, Marsh Lane Playschool and Kids 'n' Cancer UK. All four charities were chosen by the committee to be worthwhile organisations. "If it wasn't for all the help of local volunteers who make up the committee, the Gala would not exist! These people are very loyal and are dedicated to providing the best for their local community. "Next year, we celebrate our 25th anniversary - and the Gala will be around for years after that to bring community cohesion, whilst raising much needed money for charities." The Committee would like to thank all of their supporters who helped make this year's Gala such a success - and everyone who came along and made it such a great day.